Lorin Powell shoots over Murray defenders Calli Carver (11) and Elizabeth Curtis (23) in the second half of the Lady Marshals game at Murray High. 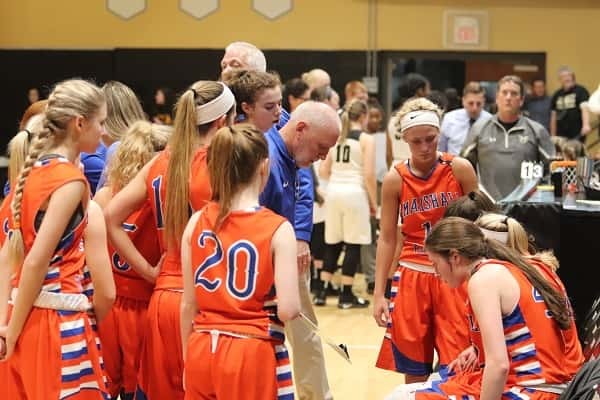 A 12 point lead in the fourth quarter slipped away for the Lady Marshals in their 35-34 loss at Murray. The Lady Marshals led the entire game until Murray’s Elizabeth Curtis tied the game at 32-32. They were tied again at 34 with under a minute remaining when the Lady Tigers took their first lead of the game with 3.6 seconds left on a free throw by Calli Carver who made the first of two, good for the 35-34 win. Halle Langhi led the Lady Marshals in scoring with 12 points against Murray. 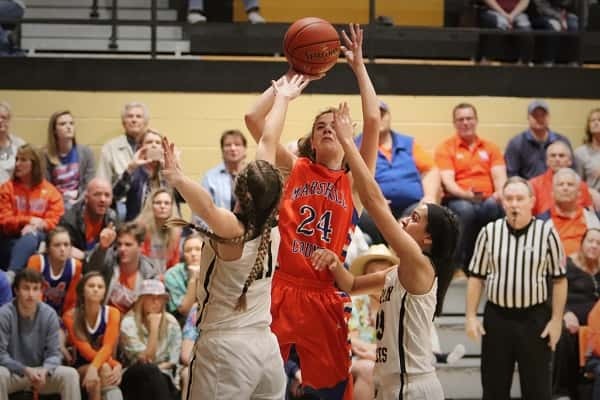 Murray has already secured the number one seed in the 4th District Tournament and an automatic spot in the regional tournament, but the Lady Marshals had something to prove following their early season 47-35 loss to the Lady Tigers. Six points by Lorin Powell helped lead the Lady Marshals to an 8-4 first quarter lead. Murray pulled to within three points in the second quarter before a 6-0 run by the Lady Marshals gave them an 18-9 lead, Murray getting the final basket of the half from Carver to trail 18-11. 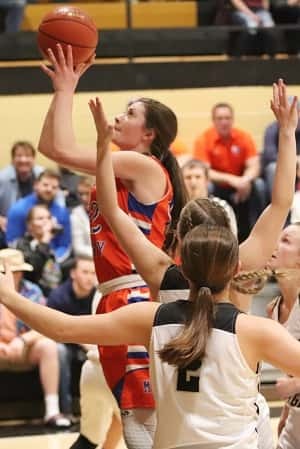 Halle Langhi opened the second half with a basket, scoring six of the Lady Marshals eight third quarter points while they held the Lady Tigers to four points in the quarter to lead 26-15. Murray out-scored the Lady Marshals 20-8 in the fourth quarter starting with the first four points by Carver as they worked to slow play down while trailing by nine. A 3-pointer from Tera Colson gave the Lady Marshals their largest lead of the game at 31-19 before Murray came alive from 3-point range, dropping in three straight, two by Curtis and one from Angela Gierhart to cut the Lady Marshals lead to three. Carver scored to cut the lead to one point with 2:05 remaining in the game followed by a free throw from Colson to put the lead back to two. Then the tie by Curtis was followed by a basket by Langhi, drawing the foul but missing at the line. Carver tied it 34-34 and the Lady Marshals had the ball with 52 second to go. A turnover on the in-bounds led to a Marshall foul on Carver who dropped in the first of two at the line for the one-point win. Carver led Murray in the win with 14 points while Langhi led Marshall County with 12. Assistant Coach Don Walker, talks to the Lady Marshals during a time-out in the closing seconds against Murray.